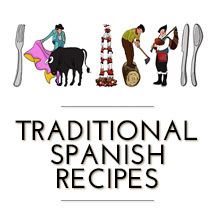 Spanish Recipes by Núria: Spanish Recipes in English. Great food Photography and step by step recipe instructions. 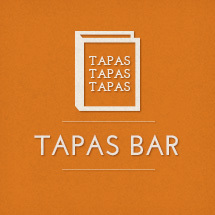 Spanish Recipes by Núria - Spanish Recipes in English. Great food Photography and step by step recipe instructions. Pasta in Black and Pasta in White. Black Linguini versus White Spaguetti. Last week, after lunch and while watching TV, we bumped into the wonderful film: Gone with the Wind. I cannot help it, I must watch it… no matter how many times I cried with it… I have to cry and cry again and wonder how life and people has changed from those days to nowadays. That famous sentence rumbles in my brain: “A Dios pongo por testigo que nunca más volveré a pasar hambre”, when Scarlett is at Tara’s garden and claims to God that she will never be hungry again. As far as I know, many of my ancestors suffered from hunger… I cannot imagine how horrible that could be. Me and my family have been lucky enough to have plenty of food and comfort in life. I feel really grateful and wish everybody could have 3 meals a day. So, this is my Christmas wish: No more hunger in the world! Do you want to put your little sand grain too? Then, make a dream come true. 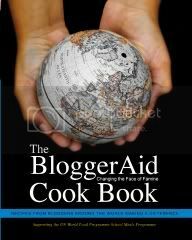 Get your own BloggerAid CookBook, enjoy the recipes and give kids a hand ♥. Just a click away from you. If you want to save some money to order the book, here you have 2 cheap, healthy and easy recipes to help you! 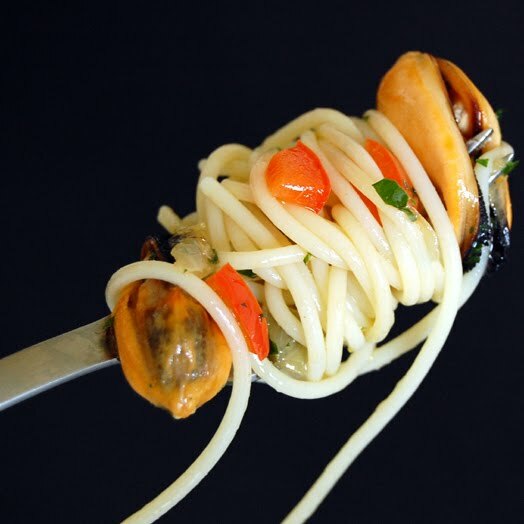 Black Linguini with artichokes and green garlic and White Spaguetti with mussels and red pepper. 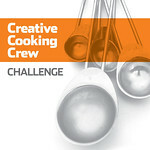 I’m sending over both recipes to Kevin from Closet Cooking, who is hosting Presto Pasta Nights this week. Don’t forget to send your recipes and take a look at the round up… there’s always wonderful new ideas! PPN is Ruth Daniels’ famous and “old” event… this will be the 142 serving!!! 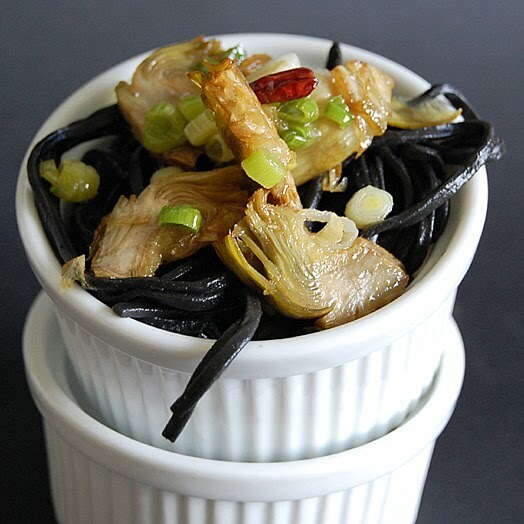 Black Linguini with Artichokes and green Garlic. Ingredients for 4 servings: 400 grs of Black Linguini, 4 Artichokes, 6 green garlics, 2 small dried red chillies, olive oil and salt. Pour some olive oil in a big sauce pan and heat. Cut and peel the greener artichokes leaves; discard. Place inside the sauce pan the artichokes hearts cut in thin slices. Put the 2 chillies and cook at low heat until the artichokes are tender. Add the green garlic cut in slices and stir for 1 minute. Taste and add salt if necessary. Strain and reserve. Get some salty water boiling and add the Linguini. Follow package instructions and once cooked, strain and mix with the artichokes. 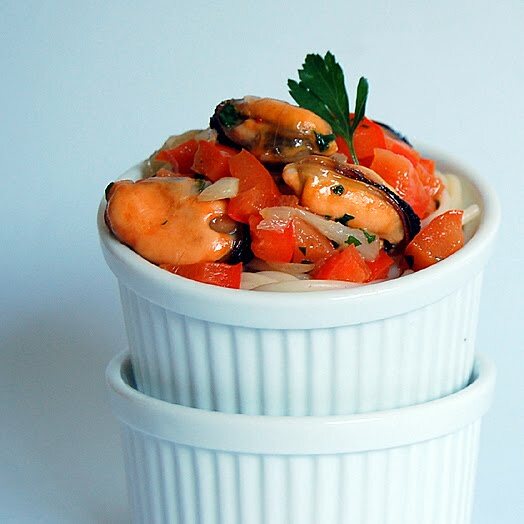 White Spaguetti with Mussels and Red Pepper. 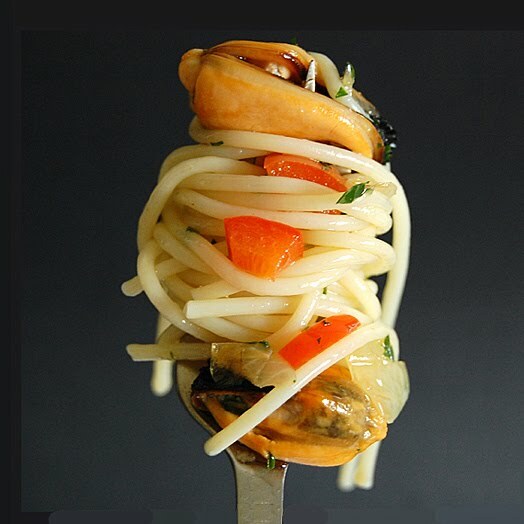 Ingredients for 4 servings: 500 grs of fresh Mussels, 400 grs of White Spaguetti, 1 red pepper, 1 small glass of white dry wine, 1 onion, 2 garlic cloves, a spring or two of fresh parsley, olive oil, salt and black ground pepper. Clean and steam the mussels. Discard the shells and keep their meat. Peel and chop the onion. Prepare a sauce pan with some olive oil. Pour the onion in and cook until transparent. Then add the cleaned and chopped red pepper, when tender add the peeled and chopped garlic. Stir until fragant and add the wine, stir until the alcohol evaporates and add the mussels. Sprinkle with some salt, black ground pepper and the minced parsley, taste and reserve. Get some salty water boiling and add the Spaguetti. Follow package instructions and when done, strain and mix with the mussels. I agree with Miriam that the pictures are wonderful! I knew I had to get the recipes when I saw them on flickr. And yes, the cookbook is a way we can all help to feed some kids in need. Nuria, All I can say is WOW! What pictures, what art! You are so creative and what a cause. I am definitely going to check out this cookbook. 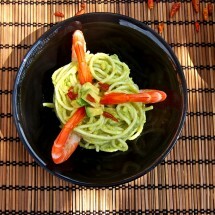 Beautiful pasta dishes, and your pictures are stunning! Wow! Your so on top of things my dear with two dishes for PPN. How I wish there was no more hunger in the world either. Besides the pasta looking absolutely delicious, that first picture looks like a work of art = a sculpture – just beautiful. You should enter it in a “guess what this is” type of contest. Fabulous job!!! I agree with everyone about the pics…muy stunning Nuria! I love the choice of your pasta and sauces Nuria! reminding us about the hunger in the world. We throw away 1/5th of our food here in America. Use it up creatively and send the savings to those with less! Both dishes are exquisite but i can’t decide which I like more. Why not have both? Today is pasta day! Both of those pastas look great! Nice photos! Thanks for sharing with Presto Pasta Nights! I hope you didn’t really throw out the water you cooked the mussels in while still in the shells…you have used it for flavoring. Nuria – You have become so artistic. I’m in awe. Cocinera y artista! Your work is really beautiful and creative. that top photo is awesome! i love how you paired those perfectly fried artichokes with the squid ink pasta. beautiful (and tasty!) combo. it is easy to forget how lucky we have it – and it’s important to be grateful and give back. thanks for the reminder. What stunning and creative photos. It’s a much more interesting way to photograph pasta than just throwing it in a bowl. Looks delicious. This is a beautiful post. Those pictures are amazing. Gone With The Wind is my all-time favorite movie! Great pasta dishes and great message. Beautiful post and such a nice sentiment. Happy Holidays. Another great resource for ending hunger is Share Our Strength. Your photographs are out of this world. 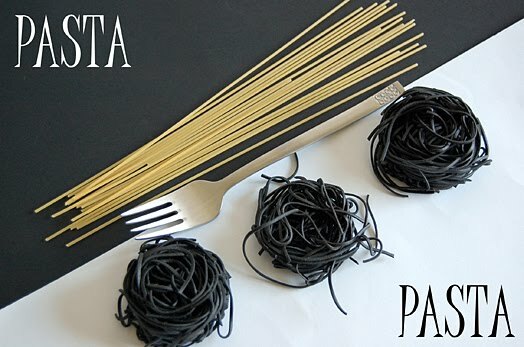 I wish I knew where to get black pasta. It is stunning with other ingredients and without. this looks really good !! and very original thanks Nuria !! aand your photos are superb !! Great movie, good food, nice pix! 12/14/2009 · 16:20 h by tobias cooks! I love your presentation. Looks delicious! What a perfectly stunning presentation, not to mention delicious recipes to go with them. Thanks for sharing with Presto Pasta Nights. 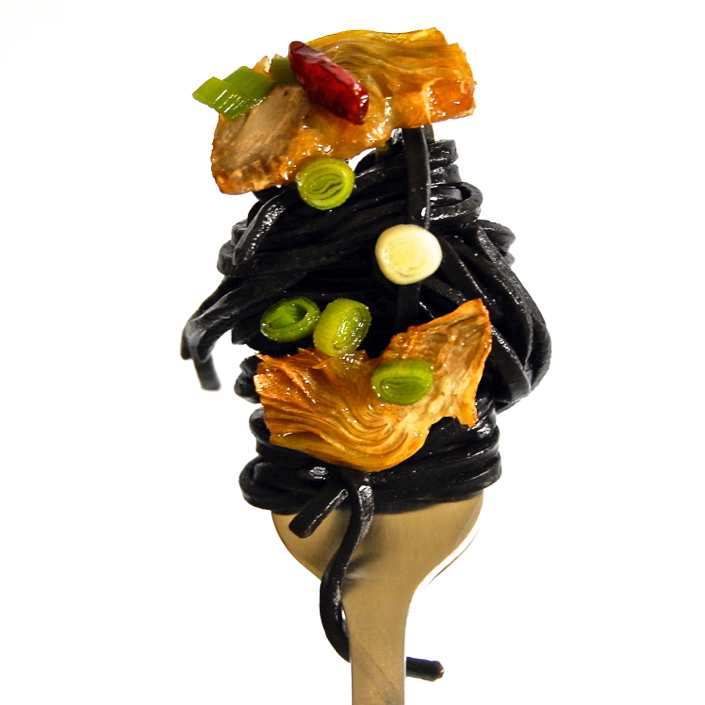 That black pasta is one intriguing looking thing! Beautiful pictures, beautiful contrasts and colors of food. I can read reread and reread Gone with the Wind. Same goes with the movie. < Foodbuzz 24, 24, 24: The Perfect Meal… did you hear Mr. Bourdain?